Anybody recognize what kit this is and what mfg'er made it? Never mind! Found out what it is: Walthers Golden Valley Depot, kit #333-3532. Like the overall shape, don't like the execution of the model above. Though I think I'm singing a solo here (or, it could I'm just boring! ), I'm in a mood to think out loud. So, here goes! I'm settling in nicely (mentally) with the idea of a coming back to TOC19 Ozark modeling. I think the operation between the two eras are going to be so different, that it WILL be like two different railroads. For starters, the tonnage ratings will be very real when running TOC19, on account of the much more limiting qualities of small steam on grades. I'm FINE with that. In fact, I DESIRE that, for I LIKE the idea of actual tonnage ratings. I have ALWAYS desired ruling grades (that will require helper operation) on ALL TOC19 theme track plans that I've designed over the past 3 decades. (And I have designed a LOT of TOC19 track plans.) So there's that plus. Another plus: I'm rediscovering the interesting power that plied the Ozark mountains. I'll share a couple in this post. The above 2-8-0 is a Pittsburg product of 1882, built for the ES Rwy using similar specifications of the connecting Frisco's new Baldwin 2-8-0's. The main difference being 44" drivers on the ES Rwy's #1. Which I think, along with the large-ish cab, give the engine a "narrow gauge" C-class look. 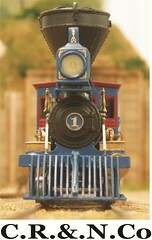 To me, #1 is a fine looking engine and I would be more than thrilled reflecting its lines using MDC OT 2-8-0's. ES Rwy No. 1 was purchased for the 2.6+% ruling grade of the ES Rwy. First point: A 4-4-0 on 2.6+%?? Yup. Not only on this line but on the Frisco as well. ES Rwy No 2 was a product of the Dickson works and had 68" drivers and 19x24 inch cylinders. Also note the impressive scenery the above photo was taken amid. No, it ain't Colorado, but the Ozarks afford ample opportunity for some semi-dramatic stuff if desired. So, in recap: I'm getting more and more comfortable with my "Ozark dual-era" decision, and I really do think it's a decision that can result in a win-win for me. Now... back to the track planning! That is some very nice photos Andre! 2.6+% that sure is mountain railroading. Like the look of the 2-8-0. I agree it looks much like a "narrow gauge" locomotive. But the persons in the picture tells its a large loco. A Roundhouse mechanism together with the superstructure of a Rivarossi 4-4-0 like the examples made by Harold, Mike and Luke. Don�t worry, Andre, we�re listening even if we don�t always respond. Nice photos. The Ozarks�like the Appalacians�have their share of dramatic scenery. The most rugged of the Ozark lines was a 19 mile short line named the "Black Mountain & Eastern" (later renamed the "Combs, Cass & Eastern".) The BM&E was registered as a "Common Carrier", but its main purpose was to move timber products produced by Phipps Lbr. Co. from some of the sawmills located along the line, as well as a good sized Phipps lumber mill at Cass, AR. The BM&E had several tall trestles and a section with switchbacks with grades that went upwards of 5%-6%. A couple decades or more ago, I hiked all of the roadbed that was only accessible by foot. (Some of it could even be driven on at the time.) I discovered that one of the trestles was a curved trestle, right at 125'-135' at its deepest. However, the center bents sat right at the edge a 25' tall rock ledge with a waterfall. So, total height from the rail to the base of the waterfall was about 150'-160'. From the rail head to the bottom of the "hollow" (valley), would have been another 400' feet. Looking up the mountain from the trestle location the summit of Black Mountain could be seen above you at 2100'. I remember imagining what a sight it would have been to be standing atop a boxcar when passing over such a magnificent scene. The BM&E locomotive on the above train is an ex-Frisco Baldwin 2-6-0. The boiler is a straight boiler, so the using either an AHM/Pocher or Mantua Rogers boiler may not be approach I would take. IF I can lower an MDC boiler enough and still clear the Sagami 16x30 can, then I would stay with the MDC boiler, cut off the MDC domes (replacing with fluted domes), and figure out a way to shorten the smoke box. I think the tall cab would have to be represented by combining two MDC OT cabs, or just bite the bullet and scratch build it. I will wait before seriously considering starting such a project. Instead, when the time comes that I shift to my TOC19 era, I will get one or two of my long smoke box MDC 2-8-0's operational first. THEN tackle the time consuming chop jobs later. Looks like I'll be buying stacks from your Shapeways store so I can have some stacks that match that lovely stack! LOL! Understood on the "not always respond", I do tend to post up a bunch of stuff when I do post. Yes, the Ozarks (and Appalachians) have all kinds of dramatic scenery. The Appalachians had the advantage over the Ozarks because of their abundance of coal. The coal in Arkansas was more to the southern edge of the Ozarks, with far more of it in the Arkansas Valley region and over south/southeast of Fort Smith, AR. Any of you hear anything on the Athearn release of their 2-8-0's? Well, crud. There was more I wanted to talk about, but this post has gotten WAY too long, so I'll pinch it off and get off the pot. I remembered there's still a TOC19 item up in the attic. SO, I went ahead and backed the car out, pulled down the folding ladder, and climbed up to take a look. Sure 'nuf, as I remembered, I had a box of parts for the old AHM "Backwoods Engine House". As I remembered, it was up there, and also like I remembered, it didn't have all of the parts. However, after inventory, it DOES have needed parts for what I would be using: The basic house structure without the add on portion. Now, since I'm going to be doing dual era, that's ONE of TWO of this model that I'll need. So it was off to eBay and sure 'nuf, there were 2-3 of these on the market. I found the cheapest NIB kit and made an offer, it was accepted, so now I have the engine house covered for a dual era. The TOC19 version will be built with the long roof vent, retain its wood shake roof, but no wainscot. It will be painted oxide red. The early-mid 1960s era will have no roof vent, and will have a corrugated tin roof and sides. I will implant ONE of the foundations into the scenery, and simply pull/replace the engine house as needed. Easy peasy. EDIT: And another thing... while up in the attic I found a box of over 60 bottles of Floquil paint! AND, looks like about 70% of it ought to be usable. Added to the 30 or so usable bottles already out in my hobby building, I'm pretty good shape on Floquil paints! Andre, the recent historical context posts are excellent!! If you�ve been following along with my posts, it�s no surprise that I groove on this stuff. Ozarks railroading is railroading after my own heart. The scenery is spectacular and the history is engaging. I love the developing dual-era plan. Fantastic plan for the engine house. It�s all coming together and you have a great cheering section here on the forum. BTW - decals are on the way! I don�t recall seeing that enginehouse model before. Looks very appropriate. Glad you're enjoying the mini-series on the Ozarks. I have been thoroughly enjoying reacquainting myself with the formative reasons for my original desire to model the Ozarks some 30+ years ago (1981 or so?). One of the most fascinating rail-served places in Arkansas was in the NW portion of the Ozarks was the town of Eureka Springs. As I said, I'm discovering all over again why I was so enthralled with the Ozarks so many years ago. I'm hoping to incorporate the hint of a mountainside town at one of my town locations on the layout, but we shall see on that. I don't know if the kit is still manufactured. Over time several company's had the molds and marketed it: Life Like, AHM, etc. My version of it will be quite simplistic. "Simple" is the way things were in the Ozarks. There were not a lot of fancy n' frills in the typical depots and such. Most early structures were made of wood on account of the abundance of timber. As for "no frills", for example, I do NOT like the "pagoda" type exhaust chimney w/canopy. I will likely go with a large cylindrical stack with a conical hood on top, similar to what's seen on the ES Rwy engine house in the above picture. I will retain the ventilation structure along the roof line, because it will make a nice contrast between the "as built" version compared to the "modernized" (accomplished during the late 1940s or early 1950s) version. In all, it's surprisingly nice to have "come home" to the Ozarks in my TOC19 modeling. I'm finally anxious to get started on the layout itself, instead of inwardly dreading it (thus the procrastination), as was the case with my Colorado theme. Andre, your pictures of the Ozarks are more appealing than another Colorado layout. Those are really interesting and atmospheric photos. Grandt Line makes a nice set of stacks like you�re wanting. Your statement about Colorado echo's Mike's feelings (and others) about the Ozarks vs Colorado. I knew that modeling Colorado would make my layout just "another" Colorado layout... but I would have been fine with that PROVIDED I could do all the aspects of modeling Colorado to a level that I could be satisfied with. Enough has been said by me on that point, though. I was riding the wood pile of ES&NA #1. It was a cool April early spring day back in about '81. After whistling off at Junction, the trip back to the Eureka Springs depot had been superb thus far. We had just topped the 2+% grade and in the process of making the final run to the depot. Engineer Boyd Pyle had the One Spot hooked up and cracking smartly along at about 20-25 MPH. I was rocking and swaying back and forth atop that woodpile taking within all of the sensory input that was taking place. I was absolutely loving the sharp crack of that exhaust, and ummm... the smell of that wood smoke blowing out the stack! About then we were passing through a little rock cut and Hogger Pyle hauled down on the whistle lanyard. The 5 chime whistle bellowed and screamed it's announcement to all that we were bearing down on the depot. The sounds of that melodious whistle echoed with wonderful sounding reverberation in the tight hollow. At that moment, I literally got GOOSE BUMPS all over from the experience. I'm telling you, it was almost spiritual! I have a long time, and very good, model railroading friend (he's 87 now) that has ALWAYS loved steam. There rocking along on that woodpile, with that whistle bellowing and the goose bumps still playin' a tune on me, I distinctly remember breathing out the words, "NOW I understand why Dave loves steam"! I've genuinely loved steam ever since. That experience kicked me into high gear in learning about railroading in the Ozarks (and Arkansas), which quickly led me to my nigh-universal appreciation of TOC19 railroading. Eureka Springs grew from the presence of springs at that location that the Native Americans felt were healing waters. (And did indeed seem to have medicinal value on account of the minerals therein.) After the Osage Indians migrated northwest, the first "pale face" to discover the spring(s) was in 1854 by a Dr. Alvah Jackson. In 1879, Dr. Jackson took a well known judge of the region to the spring for recovery from what Doctors has said was an "incurable" leg infection. As can be surmised, the judge recovered and his leg heeled up. Once the word got out, a tent city started growing and within weeks there were about 20 tents set up alongside the spring. By February 14, 1880, there were 3,984 permanent residents on site! Thus, the town of Eureka Springs was incorporated. This phenomenal growth of Eureka Springs is what prompted the Frisco RR to take an interest in the area (the Frisco was building south/southeast from Monett, MO toward Fort Smith, AR), and what quickly led to the birth of the Eureka Springs Rwy. Thanks for the tip, Mike. I think I have Grandt Line's pdf catalog. I'll have to check and see. If so, I'll look for what you are referring to. Good for you, Andre! Best wishes as you move forward and accomplish this layout that will let you dip your toes in both eras. If you're like me, the planning and dreaming are loads of fun. Okay, somehow I missed this when you first posted it. Time to rectify that oversight! Thanks for the well-wishes! My decision to return to the Ozarks appears to be working out for the best. Thanks also for the ideas on naming my fledgling TOC19 route. At THIS MOMENT, I'm leaning toward the "Ozark & Arkansas Valley" (or "River"). I also am leaning toward my route starting to build south out of Springfield, MO in the late 1870s, which gives me plausibility for my fleet of Bachmann NT 4-4-0's being on the layout. Also means it was established about 2-3 years before the Frisco started building south out of Monett, MO, for Fort Smith, AR, which would have helped such a line as mine be a bit more established and thus weather the competition by the Frisco a bit better. YES, I love the dreaming and planning side of model railroading a LOT. That I've stumbled upon two really good concepts (well, good to me), namely, my Kansas City & Gulf diesel era theme, and now my Ozark & Arkansas Valley TOC19 line, is frosting on the cake! How do you think THIS type of car plays into an Ozark setting? Yes, an early high cube.